Each diamond shape, or cut, has unique characteristics that make it distinguished and desirable. Round Brilliants are the most popular and easily recognizable from all the diamond shapes. They are incredibly sparkly because of their intricate faceting and symmetrical shape. Cut: The round brilliant diamond easily has the most sparkle and fire from ALL other shapes! The desirable aesthetic of round brilliants, along with the fact that it requires the most time and amount of rough diamond to produce, are a few reasons why round brilliants are also the most expensive of all diamond shapes. In addition, the faceting in round brilliants helps mask imperfections and increase the appearance of color (in a good way). There is no question that if you love the “bling” effect, the round brilliant is for you. Round brilliant diamonds are the most common shape for both jewelry and engagement rings. The versatility and brilliance of these diamonds makes them go well in most any setting! Quality: Because they are great at hiding imperfections and color saturations, we would recommend a minimum of J color and SI2 clarity depending on the exact diamond and other factors. To view quality and size comparisons from our loose diamond video gallery click here. Cushion Cut diamonds offer a softer visual with a square and rectangular shape and rounded corners. Cut: There are a few variations on the actual type of cushion cut. Most common cushions are called the Cushion Modified. These will exhibit what we call a "crushed ice" look where there are many small flashes of light giving off sparkle. There are true Cushion Brilliants which are rare and give off bright flashes of light with 8 main pavillion facets. The next type is a Cushion Hybrid and these have crisp clear faceting and bright sparkle with a larger than average face up size appearance. Keep in mind that diamonds listed as cushion modified on the GIA report can still exhibit the beauty and optical properties of a cushion brilliant should the pavilion facets be arranged properly. Quality: Regular cushion cut diamonds with the crushed ice look will exhibit color more easily. For a regular Cushion Modified, opt for I color and above if you want it to look very white. Cushion brilliants and hybrids tend to hide color very well and a J color can have a nice white face up appearance. Depending on the types of inclusions, SI2 and above can be acceptable for cushions. Ratio: Cushions tend to fall within the length to width ratios of 1:1 for a more square look, all the way to about 1:1.2 for a more rectangular/elongated look. We find the 1:1.1 ratio a popular range for elongated cushions. Generally an elongated cushion will look bigger on the hand because it takes up more length on the finger. To view quality and size comparisons from our loose diamond video gallery click here. Princess Cuts are typically square in shape with sharp corners. There are variations in terms of the chevrons, or central faceting, within each diamond. Some princess cuts have 2, 3, and 4 chevrons reaching the edge of the diamond. The less chevrons there are the more dispersed and spread out the sparkle the will be. See photo to the right. Save for the central faceting that looks like an X, count the number of subsequent chevrons on each image. The 4 chevrons look gives a very glittery effect because of so many tiny facets coming together for a very condensed brilliance. While the number of chevrons can be seen on the certificate and which one you prefer is definitely up to you. Quality: Based on your color sensitivity, J color is a good starting place for a princess cut. SI2 and above depending on your diamond is a good option as well since they are quite good at hiding imperfections. Ratio: Princess cut diamonds are supposed to be a perfect square, so the length to width ratio of a princess ideally will be about 1:1. While these are harder to find, there are some princess cuts with a more elongated look however the perfect square is a traditional princess cut and even up to 1.05:1 ratio. To view quality and size comparisons from our loose diamond video gallery click here. Emerald cut is thought of as one of the most classic rectangular diamond shapes. Cut: Emerald cuts are a step cut meaning their faceting is parallel. They have an open table that allows you to look clearly into the diamond.For these reasons, the emerald cut diamonds lack the fire and brilliance of other shapes. However, the elongated shape does allow for larger flashes of sparkle when rays of light reflect through them.Some think that because these diamonds have fewer facets than other fancy shapes making them have no sparkle whatsoever. This is not the case- when a well cut emerald diamond catches the light it will offer a beautiful flash of light. Quality: Because of their open and clear faceting, we would recommend at least a VS2 in clarity, depending on the diamond. An eye clean SI may exist but would be extremely rare. Those that are color sensitive should opt for higher color however, to the naked eye J color and above work really well! Ratio: Length to Width ratio is very important for emerald cuts because they vary so drastically and will give you dramatically different appearances. For emerald, ratios will typically vary from 1.0:1.30 for a more compact look all the way to 1.0:1.60 and above for a more elongated rectangular look for the emerald. To view quality and size comparisons from our loose diamond video gallery click here. Asscher Cut diamonds were developed at the turn of the 20th century and are named after its creators, the Asscher brothers. Cut: Diamond grading laboratories also refer to this diamond as a square emerald. The overall step cut faceting and shape are similar to the emerald cut, but has noticeably cut corners that make it resemble an octagon. The additional step facets create more sparkle and fire than its emerald cut counterpart. Quality: In terms of quality, we would recommend J color and VS2 at the minimum for an asscher cut depending on the exact diamond! Asscher cuts are compact in shape and can show more color saturation so it is important to see what look would be most desirable to you. Ratio: A traditional asscher cut is meant to look square, so the ratios will be 1:1 up to 1:1.1. A longer asscher will begin to appear like an emerald cut. To view quality and size comparisons from our loose diamond video gallery click here. Radiant cut diamonds, also referred to as square modified brilliants, diamonds were created with the purpose of introducing the brilliance that was lacking in square or rectangular shaped diamonds such as asscher and emerald cut. Radiant Cut diamonds, also referred to as square modified brilliants, diamonds were created with the purpose of introducing the brilliance that was lacking in square or rectangular shaped diamonds such as asscher and emerald cut. They are similar to the step cut in that these diamonds are often rectangular or square in shape with cropped or cut corners. However the radiant is faceted like a brilliant on both the crown and pavilion which makes it more brilliant. This criss-cross faceting, which is highly visible from a face up view, makes this diamond shape easily recognizable. It is a popular option for those who love the shape of the emerald or asscher cut diamonds but desire the brilliance and sparkle associated with the round. Quality: Due to their facet pattern, radiant cuts are more forgiving to imperfections than its step cut counterparts. We would leave the minimum color at J and minimum clarity at SI2 only if the diamond is clean to the eye. Ratio: For an elongated radiant cut diamond, an acceptable length to width ratio would be 1.15:1 all the way up to 1.40:1. For a square radiant cut your ratio is going to be in the range of 1:1 and a little above. To view quality and size comparisons from our loose diamond video gallery click here. Oval Shape diamonds are basically an elliptical adaptation of the round brilliant. Oval diamond prices are relatively high due to the limited supply available. Cut: Oval diamonds are brilliant cut giving a beautiful sparkle. Ovals will usually appear larger in size than a round cut of the same carat weight. This shape helps to elongate the finger and give a very graceful appearance on the hand. Ratio: A more round and compact oval is going to have a Length to Width ratio in the 1:1.3 range whereas a more elongated oval is going to have a ratio above 1.4, closer to 1.5 ratio. The 1.4 ratio is a good middle ground, but by no means a strict number that you can’t deviate from. Quality: Oval cuts can show color saturation quite easily. This is because ovals have a large surface area and they disperse color. Generally, we recommend I color and above. If someone is extremely particular, to stay even above that. Ovals are excellent at hiding imperfections, so we recommend that the diamond should be of SI2 clarity and above only if eye clean. To view quality and size comparisons from our loose diamond video gallery click here. Marquise Cut diamonds can be described as being oval with pointed ends. Marquise shape are popular due to its slim, graceful appearance, highlighted by its pointed tips. Cut: This long and slender appearance assists in elongating the fingers of its wearer similar to the oval diamond. These diamonds also appear to be larger than their actual carat weight making them a great option for those looking for a distinguished alternative to the more common round and oval diamonds. Quality: Marquise diamonds do not hide color so easily. As a general rule, I color and above is great. An eye clean SI2 clarity and above is perfectly acceptable for marquise cut diamonds. They are generally good at hiding imperfections as with the other shapes discussed in this post because it is a brilliant cut as well. Ratio: The ideal length for a marquise-cut diamond is 1.75 to 2.25 of its width; generally, the stone should be about twice as longs as it is wide. As a general rule, we recommend getting a visual to see what marquise style appears the most appealing to you. To view quality and size comparisons from our loose diamond video gallery click here. Pear Shape diamonds also referred to as teardrops can be described as being a hybrid between an oval and marquise shape. Cut: Pear diamonds are brilliant cut giving a bright sparkle similar to oval and marquise. We do stress that the actual shape or outline of each pear diamond is extremely particular. No two pear shapes are ever cut exactly the same even if they weigh the same and that is why a real life visual (like videos we provide) is necessary to see the nuances. Ratio: Pear diamonds will have ratios between 1.4-1.7 generally. The 1.4 ratio will give a shorter and more rounded appearance with a 1.7 ratio being long and thinner. There are of course ratios in between so seeing what looks appealing to you is important. To view quality and size comparisons from our loose diamond video gallery click here. Heart Shape Cut (shaped modified brilliant) is considered to be the most romantic of all shapes for obvious reasons. This fancy diamond is really a pear shape with a cleft at the top. Cut: Heart shapes are brilliant cut diamonds with a beautiful shine. 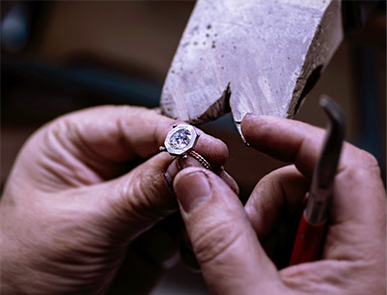 These diamonds are naturally heavy set and must be cut with extreme accuracy to ensure maximum brilliance. More so than with other cuts, hearts shaped diamonds should always be seen in person to make sure the proportions and overall shape are well designed. Quality: Similar to other brilliant cut diamond shapes, we tend to recommend J color and SI2 clarity as minimums. This would depend on your color sensitivity and the eye cleanliness of the diamond. Ratio: There are a few variations in look, but if you want something more traditional then look for length-to-width ratios between .90 and 1.10. More so than with other cuts, hearts shaped diamonds should always be seen in person to make sure the proportions and overall shape are well designed. 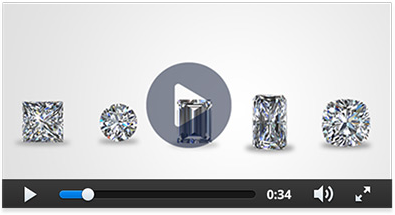 To view quality and size comparisons from our loose diamond video gallery click here. Side by side these two shapes are quite different. In terms of sparkle a cushion brilliant, or hybrid brilliant, will provide the most sparkle from these two choices because the brilliance and facets are more centralized as opposed to an oval which is more spread out. When it comes to overall spread, ovals will always look larger than a cushion cut diamond if you compare identical weights side by side. This is due to the elongated appearance of an oval taking up more space length wise on the hand, therefore giving the illusion of a larger center-stone. Cushions will have a boxier appearance and therefore fill up the width of your finger resulting in a "fuller" appearance. Take a look at this video showing a side by side of identical carat weight diamonds. Emerald vs Radiant: Both shapes have a similar outline with flat edges, cut corners and similar length/width ratios. For this reason, many engagement ring shoppers will be torn between these two shapes. They lie similar on the hand, have comparable proportions/spreads, and will give you the same general feel once set into a custom engagement ring. The major difference that sets these two diamond shapes apart is the faceting pattern and in effect how they sparkle. Watch this video in full and read along with our notes below: By looking at these two diamond cuts side by side you can see the similarities and differences. The outlines are nearly identical however the sparkle is completely different. The emerald has a subtler sparkle whereas the radiant is brighter and more dazzling. Emerald cuts are from the step cut family, meaning their facets run parallel to the center of stone, giving you large crisp flashes of sparkle and a clear look inside the stone. For this reason, they are excellent at masking color but do show inclusions relatively easily. On the other hand, radiant cuts are brilliant style, and give off more continuous flashes of sparkle. This makes them a better candidate for hiding imperfections and conversely will show traces of color more readily. Popularity: Round diamonds are the most requested and sold diamond shape, and supply and demand economy is one driving factor of its price. Rough Loss: When cutting an excellent cut round stone, a manufacturer must sacrifice the most amount of rough diamond material to achieve this shape. While other diamond shapes are great at preserving the rough, rounds will yield less making it more expensive to produce. Basic Benefits: Round diamonds that are well cut will always outshine and out-sparkle any other shape. For this reason, they also are great at hiding color. Their brilliant style faceting structure does not allow inclusions to show easily. Pears: This is one of the most intriguing diamond cuts and is a great option for someone looking to get a larger looking diamond than its stated carat weight. As with all other fancy shape diamonds, they come in a variety of length to width ratios (short and wide to long and narrow). All have the rounded tops that taper down on the edges to its distinct point at the bottom tip. Pear shapes typically come in length to width ratios ranging from 1.4:1 all the way up to 1.65:1 with the perfect tear drop outline being the most desirable appearance in all cases. Some have the preference for the longer one because it will give you more finger coverage while others rather have the wider ones to give you a fuller appearance. Emerald cut diamonds are in a class of their own; elegant, understated, and always stylish. Naturally they have a traditional feel however they do pair nicely with modern micropave ring styles to give it a contrasted look. The step cut faceting creates a “hall of mirrors” effect where the facets reflect beautifully off each other and create large, clear flashes of sparkle. Clarity is something to be wary of; VS clarity and up is best for this range because there are fewer facets and imperfections will be easier to detect to the naked eye. In the same sense, color is less noticeable and going with a “J” color should be a strong consideration. It is a unique cut that is versatile, combining elements of round brilliant, emerald, and princess cuts. The radiant has the same outline shape as the emerald cut, with its trimmed corners, but is a brilliant cut, versus the emeralds step cut, so it creates the sparkle and fire of a round instead of large flashes. The Radiant cut has 70 facets, compared to the round brilliant with 58 facets, so often times, a well cut stone can have immense light return. It is also a great cut because all of those extra facets hide inclusions better, making clarity range easier to work with. For radiant cuts, we offer a specially cut version that features sharper pavilion facets allowing for increased light return and a larger spread. Round: This is the benchmark for all other diamond shapes and has remained the most popular shape for years. Cut: A grade in the very good to excellent range will optimize light return and brilliance. Round diamonds are usually cut to precision and their perfectly symmetrical shape gives it that great sparkle that is evenly distributed throughout the stone. Cushion: This fancy shape diamond comes in a variety of shapes from square to elongated and in various cutting styles. Cut: Fancy shape diamonds do not receive cut grades on their GIA grading reports so judging this can be tricky. Aside from being elongated or square cushions (see diamond ratio) there are also different sub-types of cushion cuts. ; cushion modified brilliants, hybrid cushion brilliants, antique cushions and cushion brilliants. Standard Cushion Modified Brilliants are perhaps the most common, and actually the least desirable in terms of their appearance; they hide a lot of their carat weight at the bottom and give off a “crushed ice” sparkle that some may consider to be dull. Cushion Brilliants have sharper pavilion facets that give it a much more distinct appearance and larger face up measurements. Note this cut will always be more expensive than the first type mentioned. Hybrid Cushion Brilliant, our specialty at Lauren B, is a mix between the two and provides you with the same appearance and beauty of a Cushion Brilliant, but at a more affordable price point. Antique Cushion cuts are noted for its chunky facets, high crown and large culet in the center. Color Standard: cushion modified cuts will show color more readily while the Cushion Brilliant or Hybrid does a better job at masking it. For this reason, you can safely go down to “J” color for the latter. Clarity: SI2 clarity and above will be the norm for cushions. While not at the same level of rounds, cushion cuts are good at hiding imperfections because the clear facets and sparkle detract the eye from any imperfection and it will be difficult to spot with the naked eye.